For the last two months, Eagleton Center for Public Interest Polling Director David Redlawsk has been in Iowa, studying the first in the nation Iowa Caucuses, following up on work he and colleagues did in 2007-08 for the book Why Iowa?. Today we will start an occasional series of blog posts from him about his experiences and about the campaigns for president. These posts were originally published on the Drake University Caucus Blog; Dave is in residence as a Fellow at the Harkin Institute for Public Policy & Citizen Engagement. In addition to these posts, he is tweeting @DavidRedlawsk as he attends events and watches the process unfold. 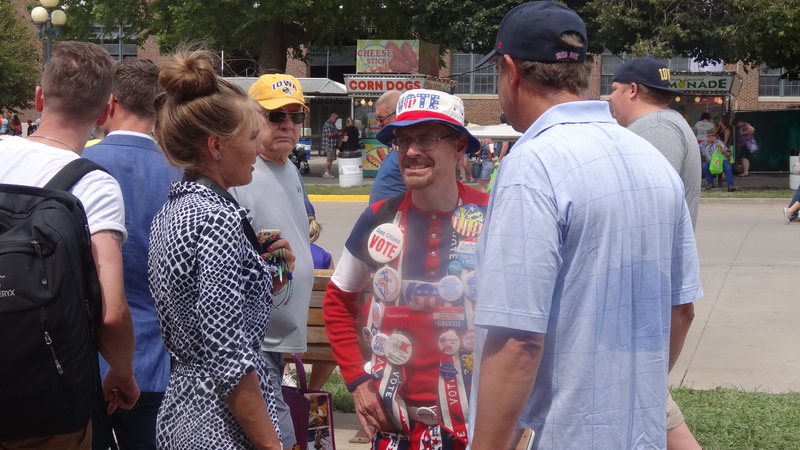 This first post talks about the experience of watching 20 candidates for president speak at the Iowa State Fair in August, at the Des Moines Register Soapbox. 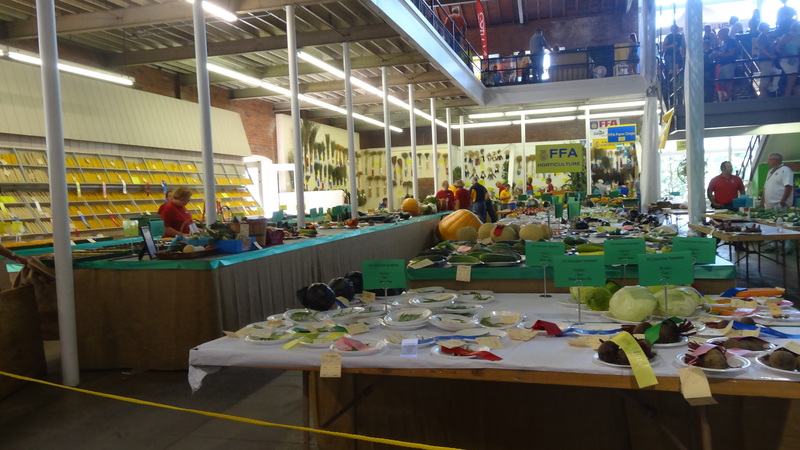 There is something wonderfully old fashioned about the Iowa State Fair. I’m not talking about the 4H projects, or the pie-judging, or the carnival midway. I’m talking about the Des Moines Register soapbox. In this day of carefully crafted media campaigns and even more carefully developed soundbites, the fact that candidates can still stand up on a stage (wish it were a real soapbox, but where are you going to find one of those these days?) and talk to real people in a less than overly controlled environment says something good about why we start the nomination process in small states. 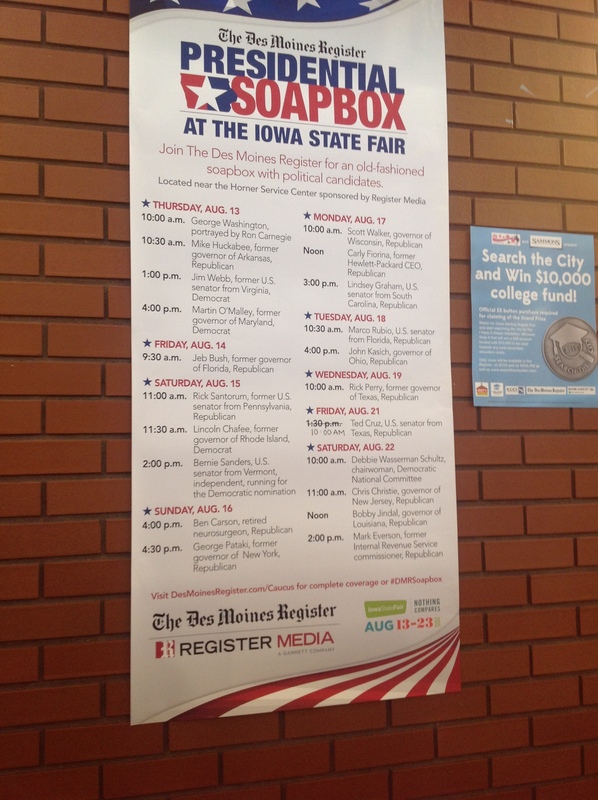 The Register does a real service to Iowa and the country by sponsoring the Soapbox. People waited as long as a hour and a half in the hot sun to see the candidates (or, on one day, in the rain). While candidates who come to the Fair are all but forced to do stupid things for the media (like eating some kind of food on a stick) they are also forced to pay attention to the questions voters ask. Those not at the Soapbox can read about it, watch it online or TV, and get exposed to their options, and many do. Even fairgoers not at the soapbox have some sense of the role Iowa plays in this process. I suppose it is pretty clear I am a fanboy for the Soapbox. After watching 19 presidential candidates (only Hillary Clinton, Donald Trump, Rand Paul, and Jim Gilmore didn’t speak at the Soapbox, while Gilmore and Paul were the only ones not to come to the fair), I can say with authority that I am exhausted. And, also, that Iowans are privileged. Of course, they already know this, and those in other states who pay attention to politics know this too. Since it is first in the nation in the nomination contest, Iowa has an outsized influence on the choices facing voters nationally. As my coauthors and I detailed in our book Why Iowa?, the caucuses engage Iowans, candidates, and the media in a kind of dance as Iowans try out one candidate after another, and the media tries to read the dynamics of an event that won’t occur for months. And of course, it’s because of the potential for media attention that these candidates come here. For some the potential is realized, either through their own performance (Carly Fiorina got a lot of buzz at least from the crowd with her non-speech, Q&A-only performance, and Ben Carson seemed much better in real life than he ever does on TV) or someone else’s (hecklers who took on Scott Walker who gave as good as he got, and animal rights activists who crashed Chris Christie’s stage and let him get off a nice zinger.) For some, like former IRS Commissioner Mark Everson, who isn’t even on the media’s list of candidates, there may have been no national media, but there was the Register live streaming the event. Of course, not everyone takes advantage, for whatever reason: Trump and Clinton were both at the Fair but ignored the Soapbox, somewhat too their detriment (at least according to chatter amongst Iowans waiting to hear other candidates.) But they still came to the Fair. Only about half of this year’s crowd took questions at all, but those that did found that Iowans ask pretty good ones. They also found that various interest groups were also well-represented. Obviously, candidates hold other events where they meet and talk to voters all over Iowa. But the Fair is the one place where they are all (literally) on the same level playing field, if they choose to come. The audience is not hand-picked, and they are not afraid to express themselves. As for the candidates, my sense is that many of them may resent having to do this, in some sense, but some really like the crowd, really like pressing the flesh (Martin O’Malley comes to mind, but Jim Webb and Bobby Jindal also worked the Soapbox crowd before their speeches). Other candidates seem less comfortable (Jeb Bush seemed a bit uneasy to me) but understand they have to present themselves this way to voters who will really matter come February 1. The Des Moines Register Soapbox, which began in 2003, has become a can’t-miss institution for most presidential candidates, and in non-presidential years for candidates for governor and Congress as well (and non-candidates as well, like Democratic National Committee chair Debbie Wasserman-Schultz.) The rules are really simple – as Register Editor Carol Hunter says, candidates get a microphone and 20 minutes to use as they wish. This is the best kind of throwback to the good old days. Fair goers can see the candidates up close, listen to their stump speech, maybe ask questions, and attempt to take measure of the men and women who want to lead this country.